Originally named gregorite, after the British chemist, Reverend William Gregor who discovered it in 1791, titanium was independently discovered by the German chemist M.H. Klaproth in 1793. He named it Titanium after the Titans of Greek mythology; “the incarnation of natural strength.” In 1797 he discovered that his titanium was the same as Gregor’s newly found element. However, the element was not successfully isolated until 1910. 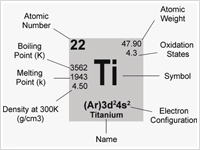 Titanium is the 22nd element on the periodic table. Its atomic weight is 47.867amu. It is a low density element (4510 kg/m3); approximately 60% less dense than that that of steel. It is nonmagnetic, and transfers heat well. Its melting point (1993 K [3020 degrees F and 1650 degrees C]) is also higher than that of steel. Titanium has high passivity; therefore it exhibits high levels of corrosion resistance to most mineral acids and chlorides. It is also nontoxic and biologically compatible with human tissue and bone, making it an ideal material for medical implant products. Rutile and ilmenite, the 2 primary minerals which contain titanium, make up 24% of the earth’s crust, thus making titanium the ninth most abundant element on the planet. However, it occurs in nature only in chemical combinations; the most common of which are oxygen and iron.